While the New York Auto Show was getting all the attention this week and the 2014 Camaro Z28, 2014 CTS, 2014 LaCrosse and 2014 Regal were basking in the show’s spotlight, General Motors quietly made an announcement on the other side of the world about two new offerings for Non-Governmental Organizations, or NGOs. Specifically, GM announced the two new vehicles for NGOs at the Dubai International Humanitarian Aid & Development Conference, and they include the Isuzu DMAX and the Chevrolet N300. The Isuzu DMAX is pretty much a Chevy Colorado and exists thanks to the unique relationship between General Motors and Isuzu. The DMAX is built in Thailand (alongside the Colorado), and will be sold exclusively in Africa. The Chevy (cough, cough, hard hough) is for sale in emerging markets around the world (outside of Africa). The reason for our throat-clearing antics is simple: it ain’t no Chevy at all. Instead, it’s a Wuling Sunshine Pickup Truck that’s made possible thanks to GM’s joint venture with China’s Wuling Motors. The partnership forms the oft-mentioned SGMW, or Shanghai-GM-Wuling. The two NGO-focused offerings are part of GM’s International Operations’ Aid & Development Program, which was launched in October of 2012 at AidEx — the Global Humanitarian & Development Aid Event. It was then that Chevrolet offered the Trailblazer SUV and Colorado midsize pickup for NGOs, with the Isuzu DMAX and “Chevy” N300 joining the two already-existing offerings. Handling exporting functions will be International Fleet Sales (IFS) — an independent group serving as GM’s partner in exporting specialized products since 1999. IFS will distribute the vehicles and provide aftersales support and support for NGOs and other customers in the sector. For its part, IFS has entered into a five-year agreement with General Motors in October to provide the aforementioned services. Update: an earlier version of this article inaccurately stated that the Isuzu DMAX was manufactured in Africa. This is not the case, as the vehicle is built in Thailand. 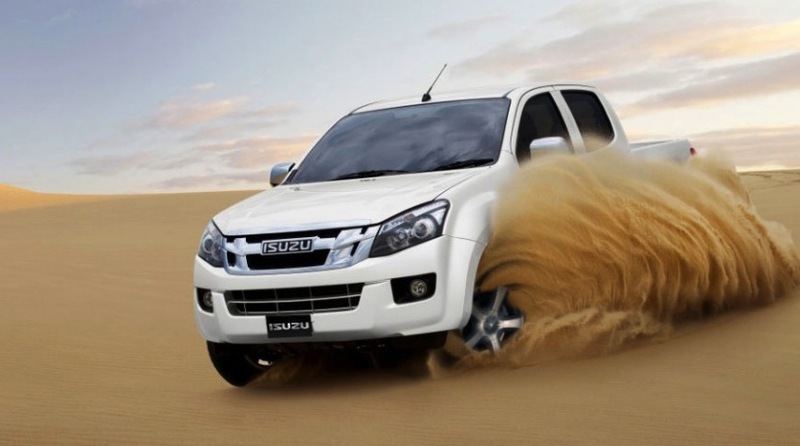 The Isuzu Dmax is also sold where the Chevrolet Colorado is sold. Here in Jamaica we have both dealers. The Isuzu dealer has more presence though. I have seen several 2014 Dmax pickups on the road but not a single Colorado. It’s a shame, isn’t it? It is a shame, if I may say so myself. I do, however, hope that as GM continues to make a serious push in the mid-size pickup truck segment with the Colorado, its presence will grow in the future. N300 looks like an old Cushman with four wheels and a modern cab, interesting anyway. Also, when can we expect this Colorado stateside? The dmax is not built in Africa,it is built in Thailand.They are very different!Whoever wrote this article needs to do their homework ! @Diesel you are absolutely correct. The DMAX is, indeed, built in Thailand. The article has been updated to reflect this. Hat tip to you, sir. Looks like a modern day Rascal van/pickup. Chinese vehicles are the pits. They’re sold in our country, and rust issues and plastic degradation issues are rampant. We also have the Daihatsu Hijet truck rebadged as a Chevrolet, and they are much better vehicle. Back in the 80’s manufatures Honda, Fiat, Diahatsu, Suburu, Suzuki & Bedford (the latter having something like 85% of the market) sold these little vans their nickname was SUTTY VANS because of a children’s TV programme called the Sutty show these little hand puppets had a little Honda Acty van to run around in – hence SUTTY VAN. Although slow the Sutty vans (most only had a 1.0 engine) they felt quicker. Nowadays they are snapped up by people wanting to put motorbike engines in them to drag race at the lights. Appeal – Do we have organisations who can support acquisition of the said Isuzu DMAX for Beekeeping Support Programme for women groups in Zambia due to the rough road network in the rural areas we operate from.